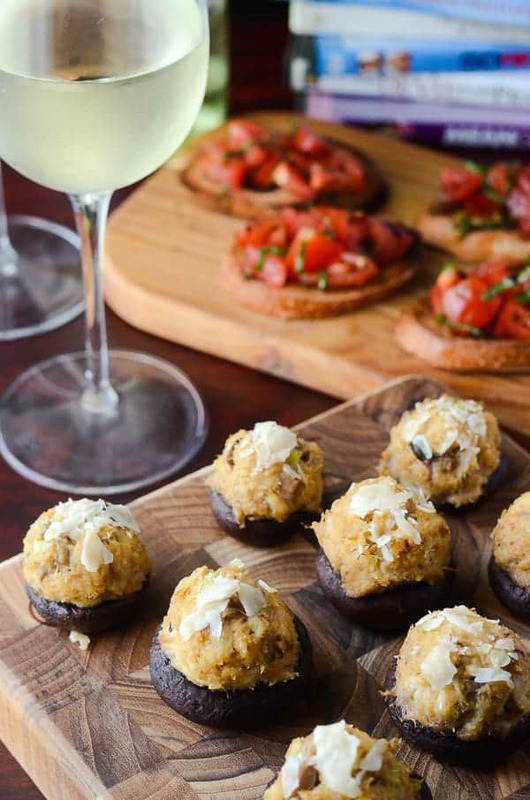 A perfect snack for any dinner, party, or a fancy “Girl’s Night In”, these Crab Cake Stuffed Mushrooms combine the simplicity of crab cakes with the fun of stuffed mushrooms. What comes to mind when you think “Girl’s Night Out”? Getting dressed up. Hitting a nice restaurant with your best friends. Having a couple of fruity cocktails. Maybe even flirting with someone on the dance floor? I love a good GNO, but many times, I’m just way too tired and lazy to put in all the extra effort of getting ready to go out and spend a big chunk of money on quality time with my girls. Which is why I enjoy the alternative Girl’s Night IN so much – same quality time, minimal effort, delicious homemade food and drinks, and, if you have cool friends like I do, you may not have to wear more than your pajamas! 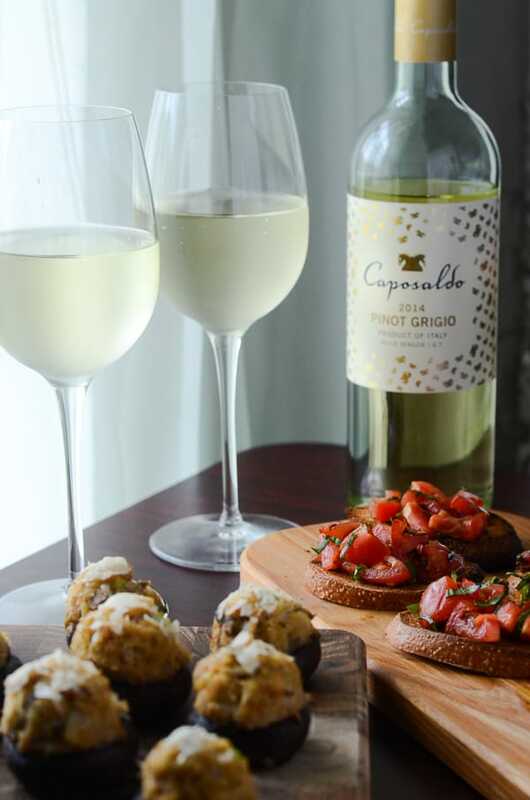 For the fancier Girl’s Night In, though, I like to bring snazzy little appetizers like tomato-basil bruschetta, and these Crab Cake Stuffed Mushrooms, both of which pair perfectly with a cold Pinot Grigio. JUST TAKE ME TO THE CRAB STUFFED MUSHROOMS ALREADY! If you’d rather skip my (pretty darn helpful) tips and tricks, essential cooking info, and similar recipe ideas – and get straight to this deliciously easy appetizer recipe, just scroll right on down to the bottom of the page where you can find the printable recipe card! Friends…I’m in desperate need of a fantastic Girl’s Night In. My Girl’s Night Out situation seems constantly covered. Visiting the theme parks with Angel. Having a couple of beers after work with Jerrica. Playing foodie critic with Lara. I’m always bouncing around with my girlfriends. I’d be lying if I said I never wished I could do it all from the comfort of my wonderful couch. 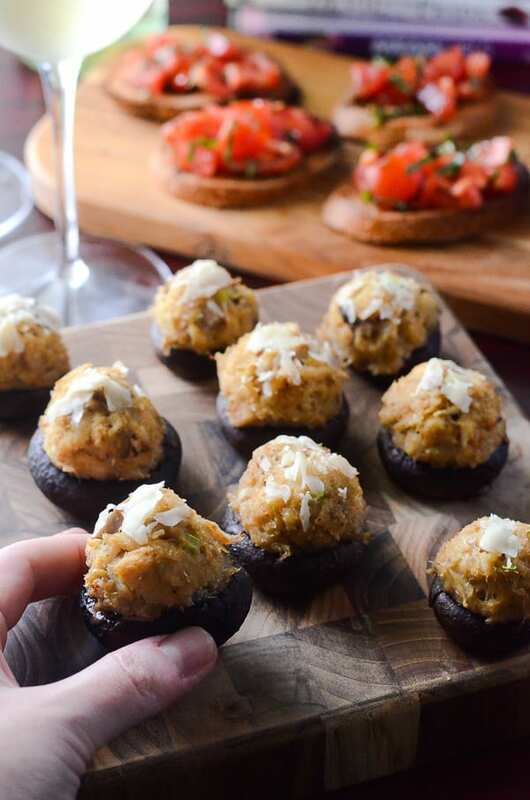 These Crab Cake Stuffed Mushrooms are the perfect party appetizer! They’re fancy enough to fit in at any holiday party, but not so stuffy that football fans won’t grab them at your Game Day shindig. 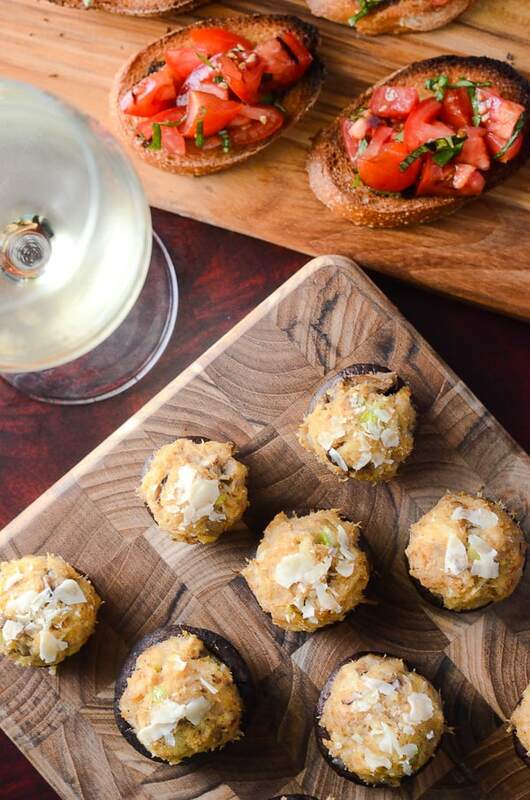 We’re talking savory butter-baked mushroom caps, topped with the cutest, tiniest little crab cake. You might be hard-pressed to keep yourself from eating them al yourself. I recommend a double batch! Preheat oven to 350 degrees F. Clean mushrooms and reserve stems. Brush mushroom caps with melted butter and bake for 10 minutes. Place the baked mushrooms in a colander and allow to drain the excess moisture. In a small pan, saute garlic and mushroom stems together in butter until tender. Cool slightly before mixing them together with diced celery, scallions, breadcrumbs, egg, dijon, mayo, salt, and peppers. Scoop ½ to 1 tablespoon crab cake mixture on top of upside-down mushroom caps. Sprinkle with Parmesan cheese, then bake another 10 minutes. 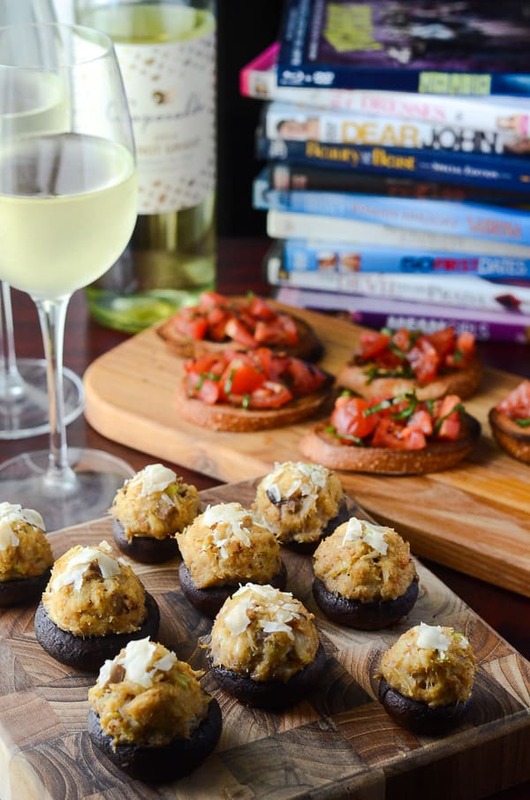 LOOKING FOR MORE EASY PARTY APPETIZER RECIPES? Also, don’t forget to follow me on Instagram and tag #crumbykitchen so I can see all the wonderful recipes YOU recreate from this site! You can also subscribe to my weekly newsletter so you never miss a delicious recipe again! 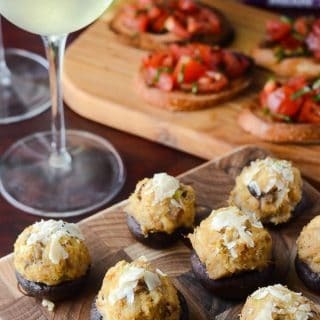 A perfect snack for any dinner, party, or a fancy "Girl's Night In", these apps combine the simplicity of crab cakes with the fun of stuffed mushrooms. Preheat oven to 350 degrees F. Clean mushrooms and remove stems, reserving them. Set mushrooms cap side down on a foil-lined baking sheet and brush with 2 tablespoons melted butter. Bake for 10 minutes. When done, drain the excess moisture from the mushrooms through a colander. Reset the caps on the baking sheet and set aside. While mushroom caps are baking, in a small pan, melt remaining butter, and saute garlic and mushroom stems together until tender, 3-4 minutes. Remove stems from heat and cool slightly before adding them to a bowl with the remaining ingredients. Mix together until evenly distributed. Form ½-1 tablespoon-sized balls of crab cake mixture, and set on top of upside down mushroom caps. Sprinkle with shaved or grated Parmesan cheese if you'd like, then bake another 10 minutes. What’s your favorite way to enjoy a Girl’s Night In? I so wish we lived closer so we could have some girls nights! 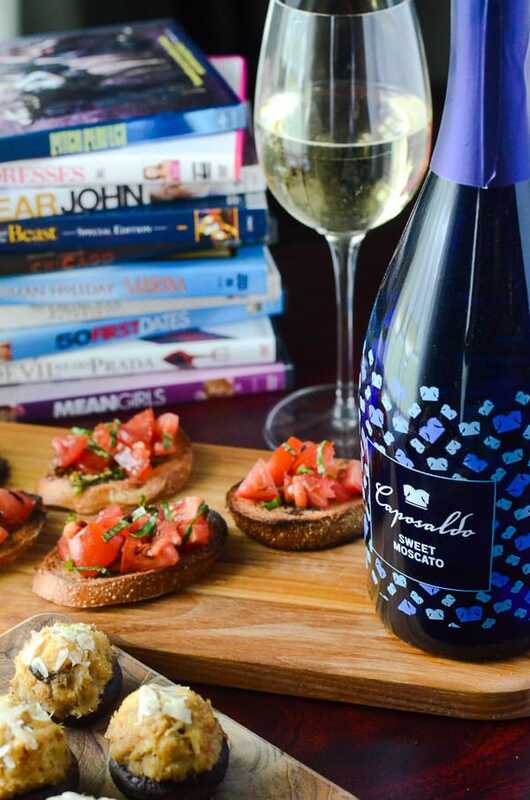 I love, love, love Capasaldo wines, and I also love all the movies you put in the background of the photos! Such a great touch! Theses are SO simple to make and taste delicious!!! I had extra crab mix, added a bit of breadcrumbs and made crab cakes!! With some homemade Sriracha mayo!! YUM!!! Thanks for the review, Donna, and I’m so happy you loved these! They’re one of my favorite appetizers to whip up when we have friends over since they’re so darn easy! LOVE the addition of sriracha mayo, too – great tip! update; I made a double recipe of just the crab mixture, added the extra breadcrumbs and a 3rd egg. This made 8 good size crab cakes!! iI’m so happy I found this recipe!